At the November meeting of the California Water Commission, staff from the Sustainable Groundwater Management Program at the Department of Water Resources updated the Commissioners on the various activities of the Department to implement Sustainable Groundwater Management Act (SGMA). Taryn Ravazzini, the Deputy Director for Special Initiatives and the Executive Sponsor of the Sustainable Groundwater Management Program at the Department of Water Resources, began the presentation by noting that on January 1st of 2018, the Department established the Sustainable Groundwater Management Office, which resides within the Executive Division under Ms. Ravazzini’s management. 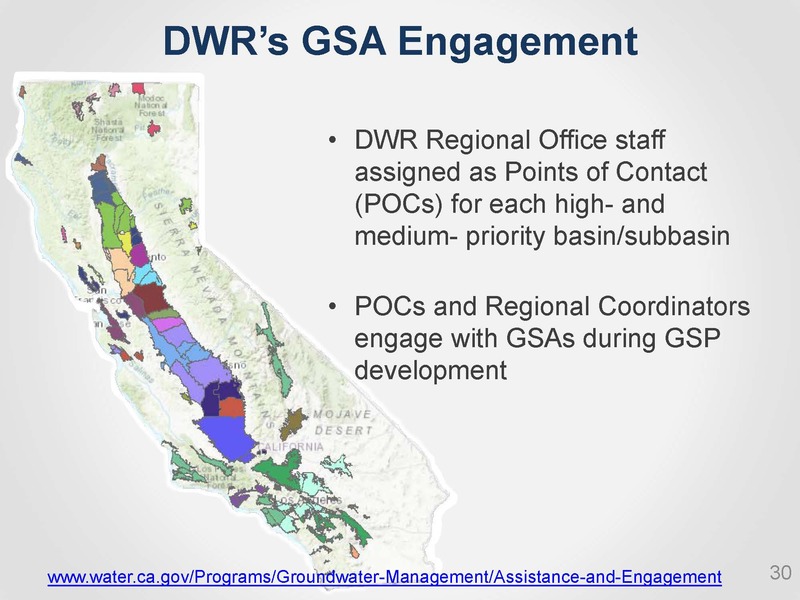 “This represents the Department’s commitment to SGMA implementation as a priority and does allow for nimble management and direct connection to DWR Executives, both of which are necessary to meet the demands of the aggressive schedule outlined in the Act,” she said. Ms. Ravazzini began with a brief overview of the Sustainable Groundwater Management Act or SGMA. The central feature of the legislation is to keep groundwater management at the local level. It is the Department’s role to be not only a regulator but to assist the local entities in pulling together their groundwater sustainability management plans, she said. 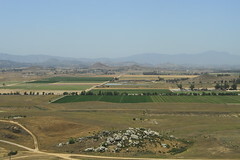 SGMA defines specific roles for three groups: The Department of Water Resources which has both regulatory and assistance roles, the State Water Resources Control Board that has an enforcing role if local agencies if they are not successful in meeting their statutory deadlines or implementing their plans, and the local Groundwater Sustainability Agencies (or GSAs) who develop Groundwater Sustainability Plans (GSPs) and implement programs to achieve sustainable groundwater management. SGMA also requires a robust stakeholder engagement process, particularly at the local level. GSAs are responsible for communicating with stakeholders and encouraging stakeholders to have a role in developing the Groundwater Sustainability Plans. The GSPs will outline how sustainability in the basin will be achieved. SGMA defines sustainability in terms of avoiding six undesirable results: chronic lowering of groundwater levels, reduction of groundwater storage, seawater intrusion, degraded water quality, land subsidence, and surface water depletion. As of 2016, there are 517 groundwater basins in the state of California. SGMA applies to all basins that have been identified as high or medium priority by the Department of Water Resources. The initial basin prioritization in 2014 identified 127 high and medium groundwater basins. Of those, 21 basins were identified as critically overdrafted, the majority located in the Central Valley. Critically overdrafted basins must be managed by a GSP by January 31, 2020; all other high and medium priority basins must have their GSP in place by January 31, 2022. The plans will be evaluated by the Department after they are first adopted, and reevaluated every five years thereafter. Annual reports will also be required following adoption of the plans. The basins must reach sustainability by 2040 or 2042; there is a 20 year planning horizon for meeting sustainability because we know it can’t happen overnight, Ms. Ravazzini said. The high and medium priority basins, as currently identified, cover 96% of groundwater use and 88% of the overlying population. 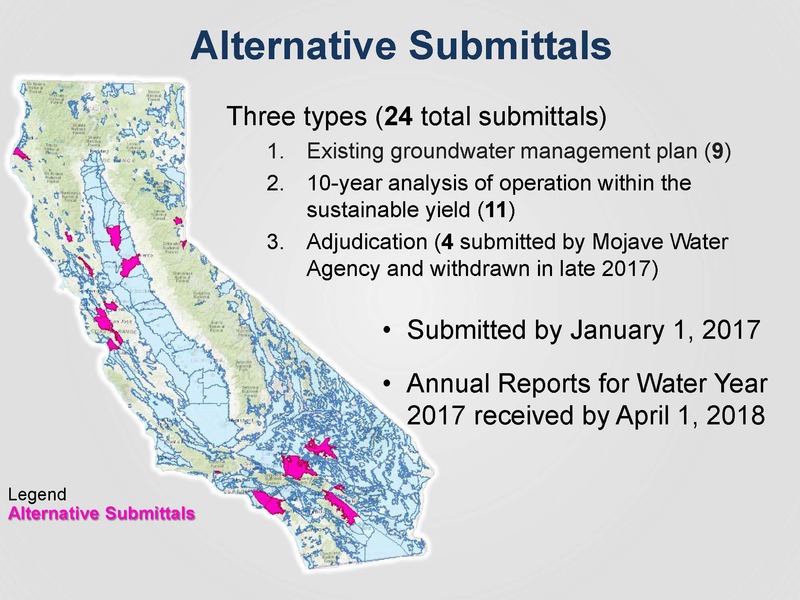 SGMA encourages every basin to be preparing Groundwater Sustainability Plans, but only requires those basins identified as high and medium priority to submit a plan to the Department. Even so, some of the low and very low basins have created GSAs and are working on developing GSPs. SGMA required all basins identified as high or medium priority to establish a Groundwater Sustainability Agency (GSA) by July 1 of 2017. 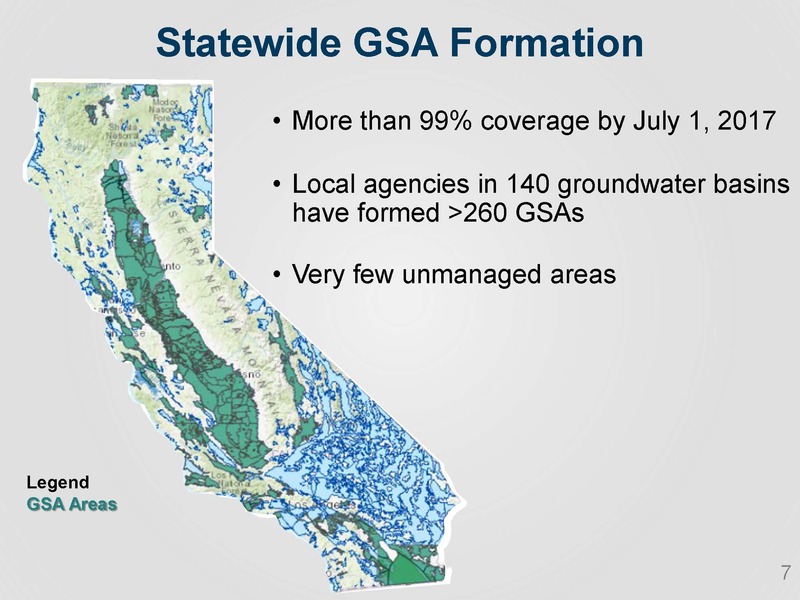 The deadline was overwhelmingly met with GSAs covering 99% of the high and medium priority basins; over 260 GSAs were formed in 140 groundwater basins. That left few unmanaged areas which then fall to the State Water Resources Control Board. The next deadline is for Groundwater Sustainability Plans in critically overdrafted basins to be submitted completed by January 31, 2020. Ms. Ravazzini pointed out that one year is not a lot of time, and there’s a lot of public engagement required, so the clock is ticking for them. The other high and medium priority basins have until January 31, 2022 to complete their Groundwater Sustainability Plans. The who: The plan will identify who will be working with the GSAs and who the GSA covers, as well as how they are going to communicate with those stakeholders. She emphasized that stakeholder involvement is an important part of SGMA. The what: GSAs are required to understand and define the physical characteristics of the basin, including a hydrogeologic conceptual model and a water budget; the basin setting and understanding of the basin characteristics is a very critical component for the GSAs. The where: GSAs have to work with stakeholders in the basin to define what sustainability is in their basins and where it will be tracked through time using a monitoring network. SGMA is outcome-based and the only way to see what those outcomes are is through a level of monitoring and data gathering throughout the time of the implementation of these plans, she said. The how: The projects and management actions are going to be critical for achieving the outcome of sustainable management. The GSAs are required to show in their GSP how they are going to plan for sustainability within 20 years and maintain after that. To learn more about the Sustainable Groundwater Management Act, click here. The Department traditionally has provided financial, planning, and technical assistance. 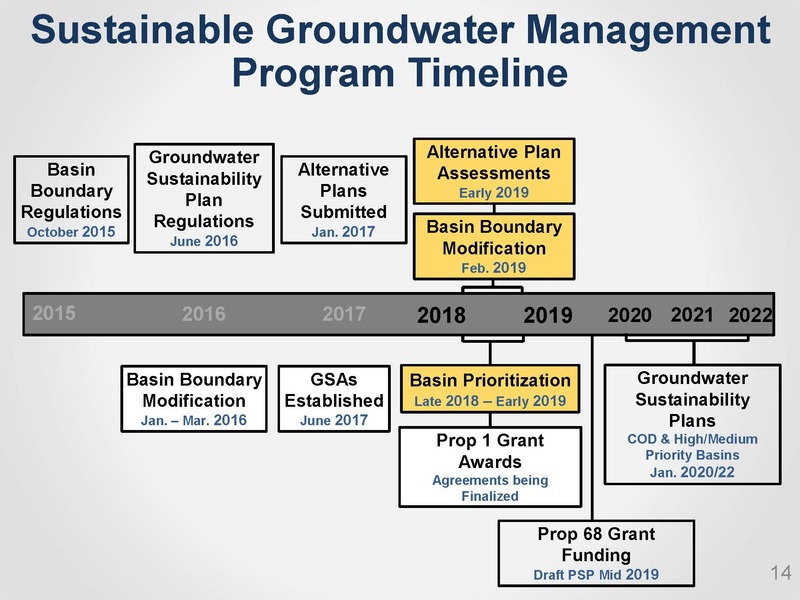 SGMA defined a new regulatory role for the Department, requiring them to evaluate the Groundwater Sustainability Plans as well as the alternatives that have been provided. There are several phases to SGMA implementation. The first phase was the development of regulations, the realignment of basin boundaries, and the establishment of basin governance through the formation of Groundwater Sustainability Agencies. Phase 2 is the development and adoption of the Groundwater Sustainability Plans, which has been ongoing since 2017. Phase 3 will be the implementation of GSPs, along with the annual reports and the outcome-based metrics and how those are applying to the basins. Phase 4 is when the GSAs reach their sustainability goals at 2040 or 2042. Ms. Ravazzini presented a timeline, pointing out that it is very aggressive timeline that has kept the Department working. The Basin Boundary Modification Regulations were finalized in October of 2015; that was followed by the Groundwater Sustainability Plan regulations which were completed in March of 2016. Alternative plans were submitted in January of 2017. The Department has utilized staff in the regional offices as the point of contact for the basins and the GSAs. Currently, the Department is working on assessing the alternative plans that have been submitted, finalizing the second round of basin boundary modifications, and updating the basin prioritization, as well as finalizing the Prop 1 grant awards. Proposition 68 has provided the Department with additional funding, so they are planning a Proposal Solicitation Package in 2019. The Department will be evaluating the Groundwater Sustainability Plans that are submitted beginning in 2020. The presentation then highlighted three key processes currently underway: the evaluation of alternative plans, the basin boundary modifications, and the basin prioritization. The Department is currently evaluating 20 alternative plans that were submitted by the deadline of January 1st of 2017. Nine agencies submitted existing groundwater management plans, eleven agencies submitted an analysis of 10 years of operation within a sustainable yield with the absence of undesirable results, and four GSAs submitted adjudications as their alternatives, but those were later withdrawn. The Department is in the final stages of evaluating the alternative plans to determine if they meet the requirements as being equivalent to a GSP. The assessments are anticipated in early 2019. The submitted alternatives are available at the SGMA portal for the public to review. The agencies submitting alternatives are required to file reports on April 1st for the preceding water year. Alternatives are to be updated every 5 years if approved. For those alternatives that are not approved, they will have to from a GSA and move forward with GSP development and are still required to meet the existing deadlines. To view the alternatives that have been submitted, click here. Steven Springhorn then discussed the status of the basin boundary modifications, noting that they will be returning at the January Commission meeting to present the draft basin boundary modifications. He began with an overview of the basin boundary modification process. There are 517 groundwater basins defined in the state currently; the basin boundaries were initially defined in the 1950s and since then, the boundaries have been updated periodically based on new scientific information and other local information. The basin boundaries define the physical characteristics and boundaries of the basin, which is important as the basin boundaries define the area that has to be managed under a GSP. 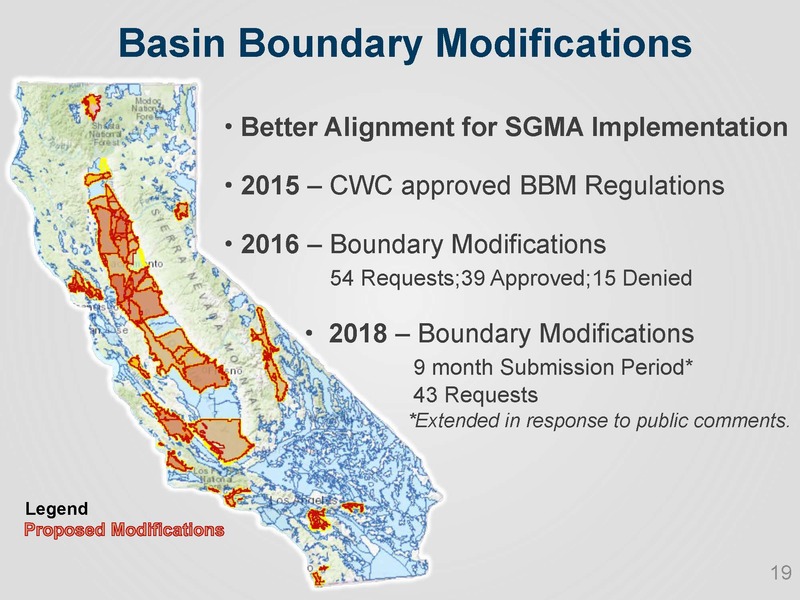 Prior to the passage of SGMA, the last time that basin boundaries had been updated was in 2003, so tSGMA also included a process for local agencies to update basin boundaries based on new information. The Department developed regulations for modifying basin boundaries that were adopted in late 2015. In 2016, the Department opened a first round of submissions for modifications; they received 54 requests, the majority of which were approved. Afterwards, folks were still solidifying their GSAs and there was additional demand for modifying basin boundaries, so in January 2018, the Department opened up another round, giving agencies nine months to submit their requests. They received 43 requests which are shown in red on the map that the Department staff are currently evaluating. The goal is to release the draft recommendations on the basin boundary modifications at some point in November. There will then be a 30 day public comment period. Mr. Springhorn noted there was a public comment period on each individual modification, but this will be an additional 30 day comment period for the draft recommendations. There will also be a public meeting in early to mid December to get feedback on the draft recommendations. After the public meeting, the draft recommendations will be provided to the Commission for their review in advance of the January meeting. During the January meeting, the Department will present the draft basin boundary modifications to the Commission; they will have the opportunity to hear from the public and be able to comment on those recommendations. “We’ll take the information we’ve gained through the individual comment period, the statewide comment period, and then the feedback we get from all of you to incorporate that and drive to finalizing the boundary modifications in the February time frame next year,” said Mr. Springhorn. For more information on the basin boundary modification process, click here. To view the basin boundary modifications that were submitted, click here. The basin prioritization process actually preceded SGMA; the prioritization occurred as a part of the legislation that established the California Groundwater Statewide Elevation Monitoring Network or CASGEM, which was a program focused on monitoring groundwater levels. 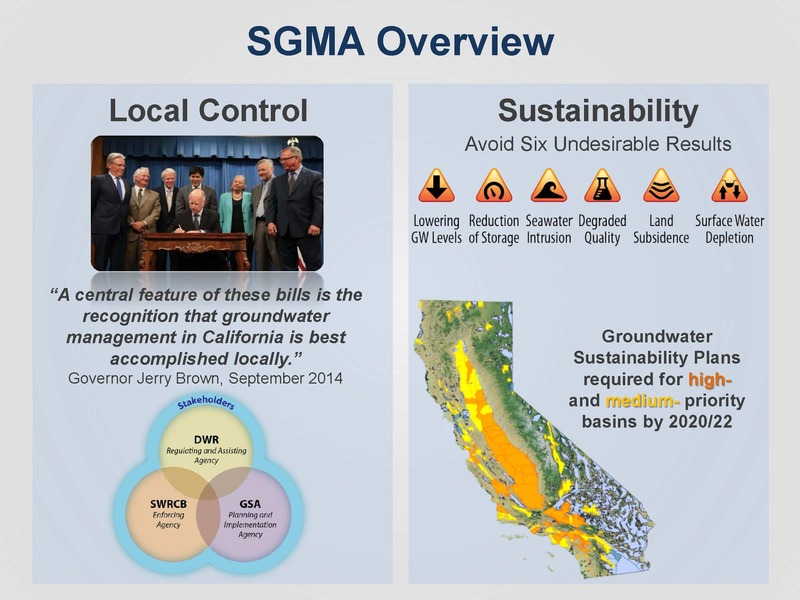 SGMA legislation began with that initial prioritization. The basin prioritization is important because those basins designated as high and medium priority are required to form a GSA and do a GSP. Those basins designated as low and very-low are encouraged to develop GSPs, but it’s not required. 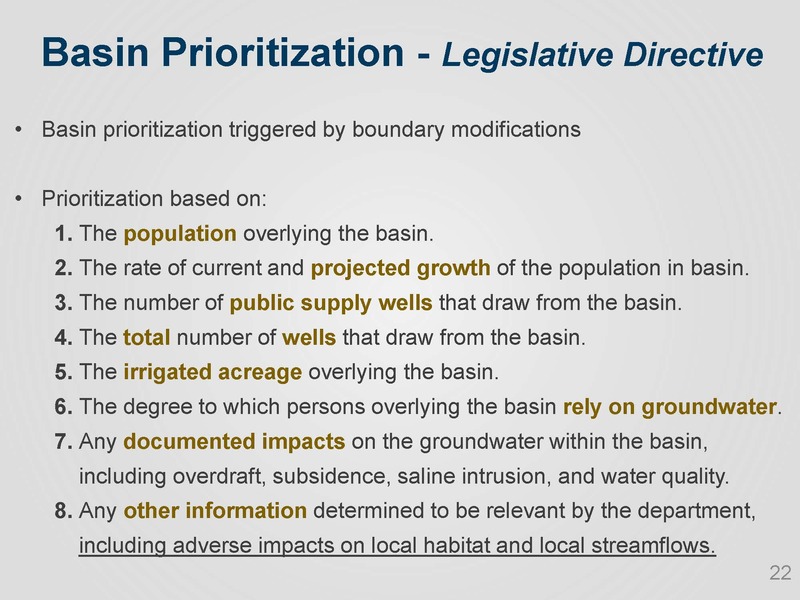 He presented a slide with the factors that are considered in the prioritization, noting that it’s really about the use of groundwater in a basin and the importance of that use to the people who live in that groundwater basin. Factors taken into account include the population within the basin, the growth of that population, the number of public supply wells, the total number of wells that draw from the basin, irrigated agriculture or irrigated acreage in the basin, the degree to which people in the groundwater basin rely on groundwater, and any other documented impacts, such as groundwater declines, subsidence, seawater intrusion, or water quality, as well as other information determined to be relevant to the Department. The Department had a 90-day comment period on the draft revised basin prioritization, which provided an opportunity for local agencies to see the draft results and the information that was relied on for those results. It also provided the opportunity for people to provide local datasets or local information that they have. The Department received almost 200 comment letters related to the draft prioritization with about 500 individual comments. 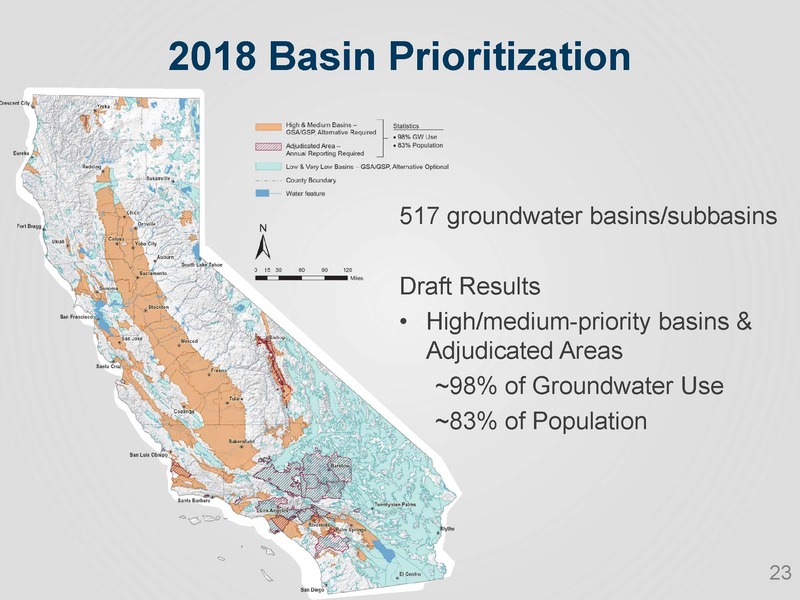 He presented a slide showing the draft results, noting that those basins shown in orange are the high and medium priority basins, noting that in SGMA, there’s no real difference between high and medium priority. The green areas are the low and very low basins, and those with the hatch pattern in red are the adjudicated areas. Adjudicated areas are exempt from SGMA as they already have a governance structure in place and have management through the courts, he said. With the draft results, the high and medium basins along with the adjudicated areas increase the amount of groundwater use that it covers to 98% of the state’s groundwater use and about 83% of the state’s population, he said. For the second phase, the Department will bring the draft basin boundary modifications to the Commission in January; they will then incorporate that feedback and finalize the basin boundary modifications and then reprioritize the basins. 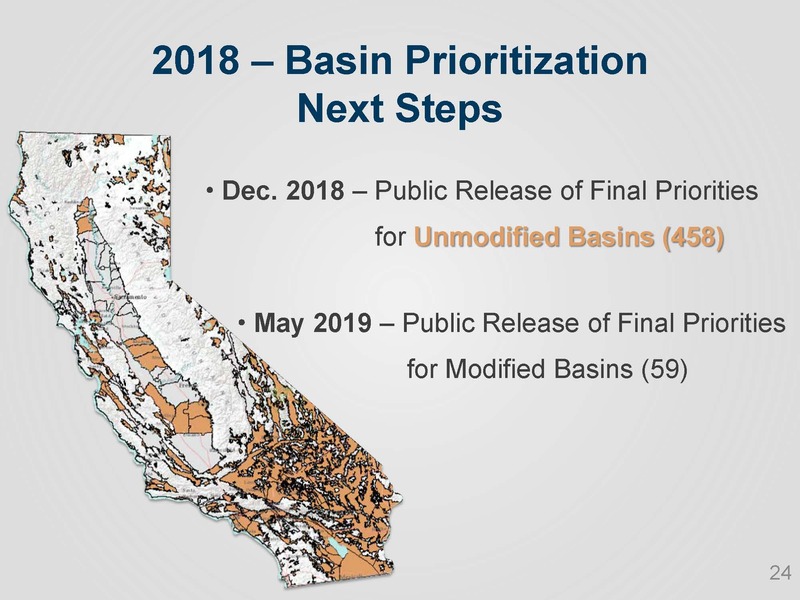 There are 59 basins involved in Phase 2; those basins will get their final prioritization in May of 2019. For more information on the basin prioritization process, click here. Simar Dhanota, Senior Water Resources Engineer with the Department, then discussed the Department’s financial and planning assistance. DWR’s IRWM financial assistance branch administers and manages the groundwater funding grants with coordination and support from the Sustainable Groundwater Management Program. Proposition 1 allocated $100 million for SGMA implementation. Those funds have been fully awarded. In February of 2016, $6.7 million was awarded to counties with stressed groundwater basins; in April of 2018, $16.2 million was awarded for projects that benefit severely disadvantaged communities, and $69.6 million awarded to GSAs for developing GSPs. 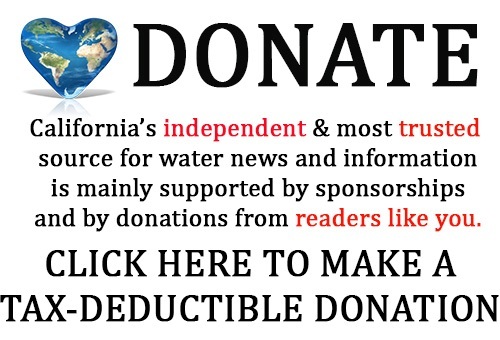 Additional funding will be provided by Proposition 68, passed by voters in June 2018. Prop 68 authorized $50 million to extend the SGMA planning grant program for the development of a GSP. The financial assistance branch is tentatively planning the draft proposal solicitation package for release early 2019. Those grants will likely fund activities to support GSP development and likely it will prioritize GSAs that did not receive Prop1 funding. 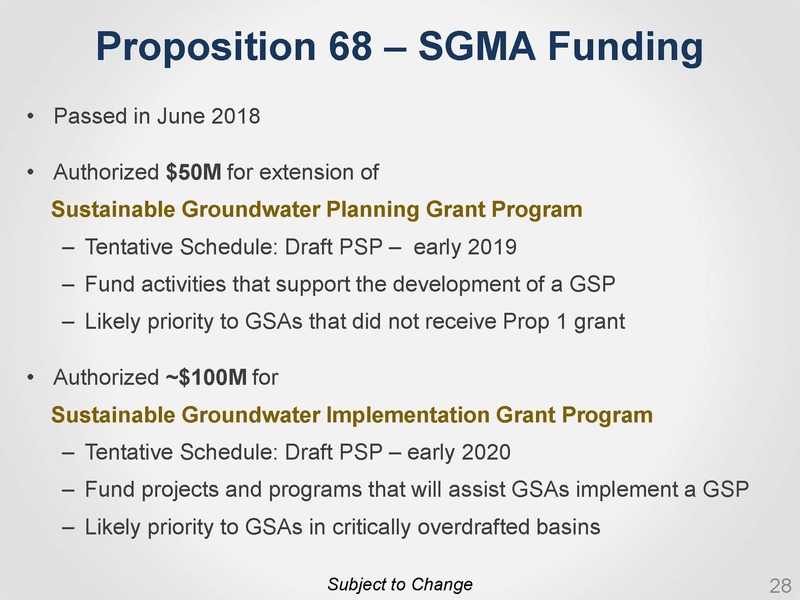 Prop 68 also authorized about $100 million for a new program called the Sustainable Groundwater Implementation Grant Program, and that would likely fund projects and programs that will assist GSAs in implementing a GSP. That is tentatively scheduled for early 2020, and will likely benefit the GSAs over critically overdrafted basins. For more information on DWR’s Sustainable Groundwater Management Planning Grant Program, click here. The Department offers planning assistance, which includes engagement and outreach activities and facilitation support services. Through these efforts, the program is promoting consistent messaging and proactive outreach and engagement with groundwater users, Ms. Dhanota said. The Department has assigned regional office staff as points of contacts or POCs for each high and medium priority basin. The POCs are intended to assist GSAs and stakeholders in the basin by providing clarifications on GSP regulations, guidance materials, data resources, and assistance services. The POCs work with the regional coordinators in the regional offices. DWR has a lot of different programs so the regional coordinators provide that cross program knowledge and perspective and lead the POC engagement. The regional offices also have groundwater leads who have technical expertise in local geology and knowledge of local water management issues. The Department also offers facilitation support services to help with stakeholder identification and engagement, public outreach and facilitation, facilitation of public workshops, GSA business meeting facilitation, and consensus building. 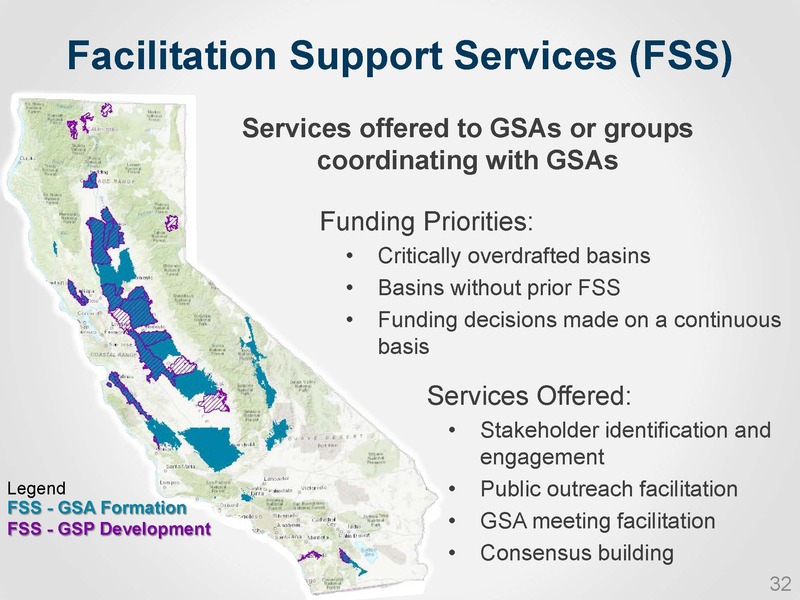 The funding priorities for facilitation support services are for critically overdrafted basins right now, and also basins without prior facilitation. Ms. Dhanota said that funding decisions are made on a continuous basin as needs are identified and resources are available. The map shows how the facilitation services have been granted since April of 2015. The basins shown in blue received facilitation support from April 2015 to June 2017; that funding was more geared towards helping GSAs form their GSAs and governance structures. After the GSA formation deadline, from July 2017 until now, the facilitation services have targeted towards GSP development and helping GSAs and stakeholders have those conversations. Since 2015, the Department has awarded $2.6 million in services to 44 basins or subbasins. For more information on DWR’s planning assistance, click here. The Department has a long history of providing technical assistance. Steven Springhorn said that the Department is working to align their technical assistance with the requirements of SGMA to make it most effective to the local agencies. 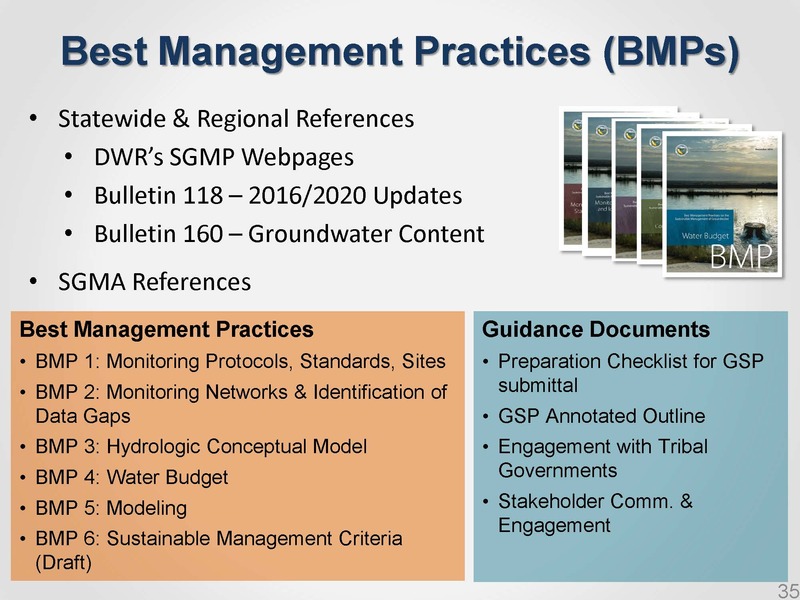 Guidance and education, such as best management practices, guidance documents, fact sheets, and other materials that work to establish a common understanding about the basins that currently exist and the new rules that are in play under SGMA. 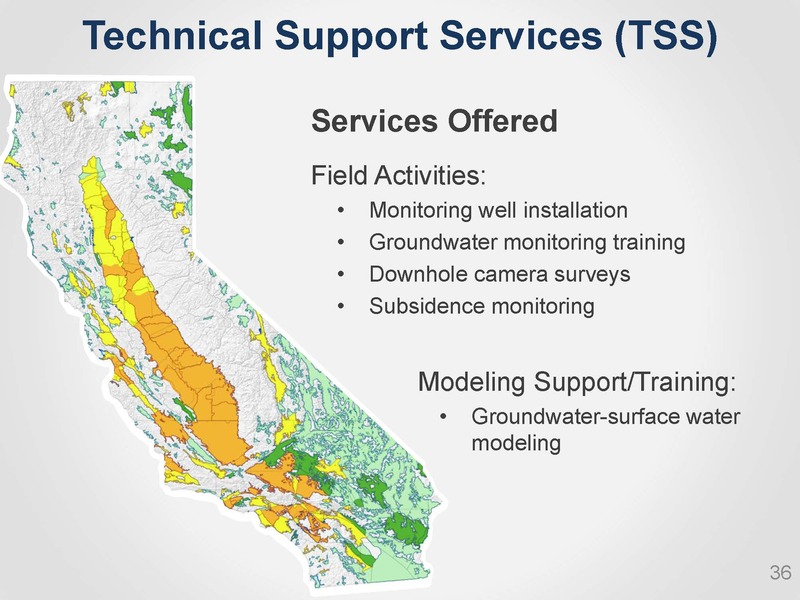 Technical support services, which is more of a one-on-one coordination with Groundwater Sustainability Agencies and stakeholders in the basins across the state. It includes projects such as installation of dedicated monitoring wells to help them understand their basins. Statewide datasets and tools, which are the fundamental datasets that mirror the undesirable results, such as groundwater level information or subsidence information. Mr. Springhorn than elaborated on the Department’s activities within each of the components. 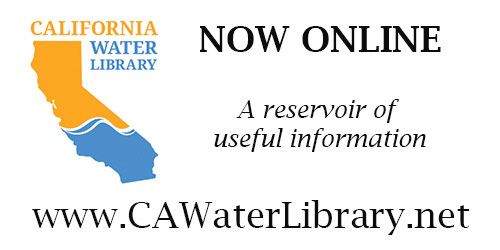 The Department has statewide and regional references available, such as Bulletin 118 and the groundwater information contained within the California Water Plan. There are also guidance documents that focus on information such as stakeholder communication and engagement, and engagement with tribal governments, as well as a GSP annotated outline and a GSP checklist. The Department is working to increase offerings in multiple language, such as in Spanish. Over time, this will include a variety of different languages. Click here for DWR’s best management practices and guidance documents. Subsidence monitoring is a technology which lends itself to an economy of scale, so the Department is looking to invest in that data and make it available to everyone in a standardized way so the GSAs won’t have to go out and purchase their own subsidence data. “They can if they want, but we’ll have that information available for them,” said Mr. Springhorn. 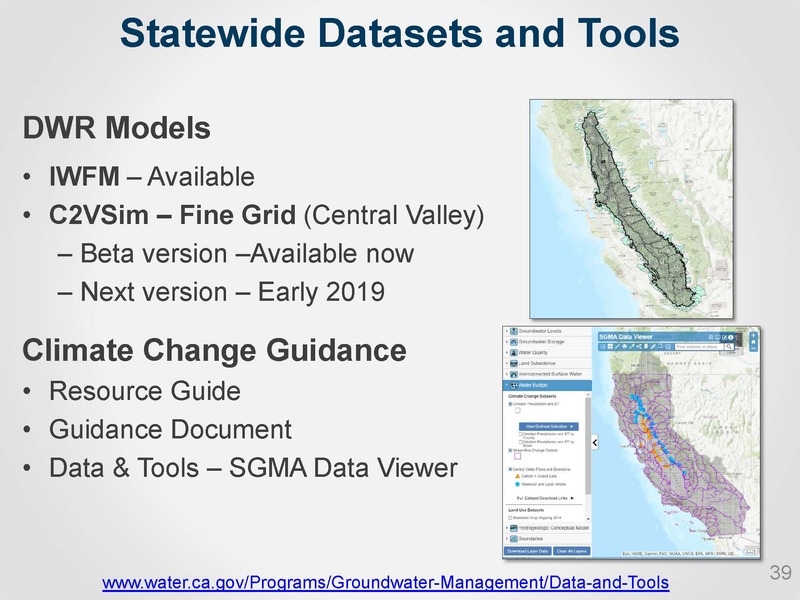 The Department has been working on updating the modeling tools to make them more SGMA-relevant, and they will be providing training to make sure people understand what those tools are and how to use them. Information on Technical Support Services is available on this page under the Technical Services tab. The Department’s Data and Tools page consolidates information from within the Department as well as other state agencies into one place. The information is organized so that people can get information related to the GSP development, such as interactive maps and modeling tools, climate change data, and other maps and reports. The Department has also been working to make data more accessible. One accomplishment of the AB 1755 Open Water Data and Transparency Act is the new California Natural Resources Association Open Data Platform. There is a lot of data available from not only DWR, but also the Department of Water Resources and other state agencies under the CNRA umbrella. The Department has been continuing to develop the SGMA portal, which is the clearing house for all the official information that’s reported under SGMA, such as GSA information, GSP initial notifications, information on alternatives, adjudicated area annual reports, and basin boundary modifications. The portal also provides an opportunity for the public to comment on that submitted information. 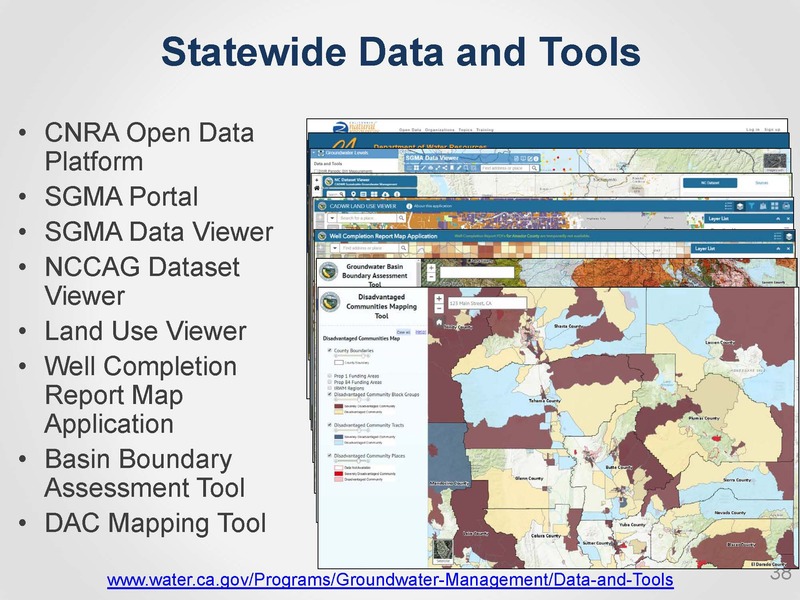 A newer tool is the SGMA Data Viewer, which has data organized by the sustainability indicators or the undesirable results, such as groundwater levels, groundwater storage, land subsidence, and water quality. “What we’re trying to do here is make information more accessible in the context that GSAs and others need it, and sort of putting all of our information into this spot where people can zoom into an interactive map and get their hands on the data they care about, and not have to download a whole statewide dataset,” said Mr. Springhorn. The SGMA Data Viewer is an unfinished product; as information comes in from local agencies and others, it will be added to the viewer. Another new tool that has been developed is the Natural Communities Commonly Associated with Groundwater dataset viewer. The dataset was developed in collaboration with The Nature Conservancy and the Department of Fish and Wildlife to identify a variety of riparian habitat and other ecosystem-related datasets and put it in to a data viewer where users can download by basin or by county. “There is a requirement to identify groundwater dependent ecosystems within SGMA and this is one place where we’re trying to put information to make it easy to get to and help GSAs identify groundwater dependent ecosystems,” he said. The Well Completion Report Map Application has the information on well completion reports that shows a heat map of the density of wells per square mile; users can click in a get to a well completion report. This can show what the domestic well depths are, the average depths, the minimum, the maximum, and a variety of useful information. The Basin Boundary Assessment Tool is a tool that was developed for basin boundary modifications. It provides geologic maps and other pertinent information, but it can be useful for GSP development for identifying the geologic materials within the basin. The Disadvantaged Communities Mapping Tool was developed in the Department’s financial assistance branch but they felt it could be useful in the SGMA context so they are making it available here. The Department also has climate change guidance that was an outgrowth of a lot of the work that the Commission did as part of Water Storage Investment Program (WSIP) and the climate change analysis. Staff worked with the Commission staff and technical staff to understand the climate change analysis that was done as part of WSIP and they built on that for SGMA. There are three types of information available: A resource guide which is a high level executive summary of the SGMA climate change data; a more detailed guidance document aimed at the practitioner who will take the data and incorporate it into their GSPs, and the climate data that that is available on the SGMA data viewer. 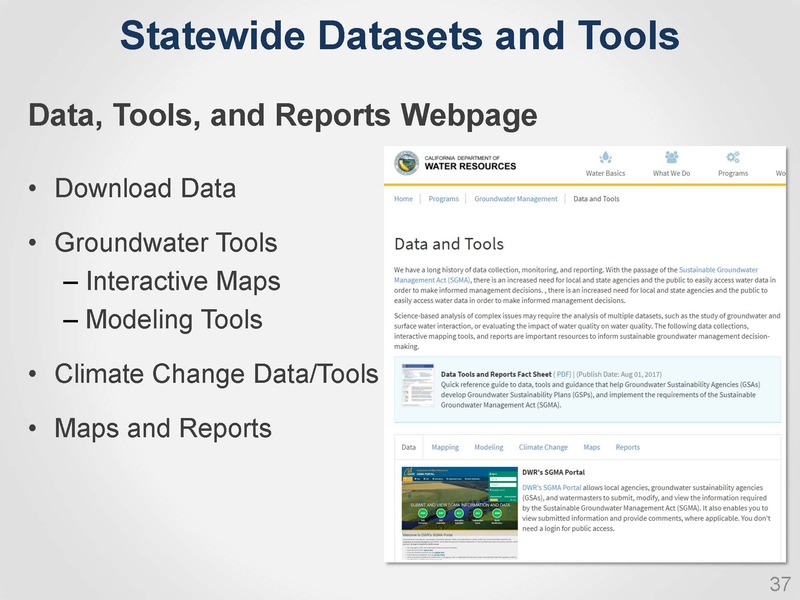 Click here to access all of DWR’s data and tools resources. Commissioner Maria Herrera asked if the Department is currently working on a best management practice or guidance documents related to water quality and how that can be addressed under SGMA? Steven Springhorn said that is in progress, although it hasn’t yet been decided if it would be in the form of a best management practice or a guidance document. A water quality survey was recently sent out to ascertain the needs of the local agencies and stakeholders. They received over 200 responses; the Department is currently compiling that information. “There’s no time frame right now of when that information will be out, but we know time is of the essence because a lot of these decisions are going to have to be made quickly on how water quality is handled,” he said. Commissioner Herrera then asked about the potential funding for monitoring wells. Has the Department received any requests from various subbasins? When do you anticipate to award those funds? Will the Department give priority to GSAs that are requesting monitoring wells to address gaps, particularly around vulnerable communities and disadvantaged communities? Commissioner Baker noted that some land use decisions are not necessarily based on data and information … how does one get through that political decision making? Commissioner UNKNOWN asks Steven Springhorn to elaborate on the undesirable result of surface water depletion. Commissioner unknown asks if environmental use is a considered a surface water beneficial use? Commissioner unknown notes that all the groundwater basins in the Central Valley have to be focused … If one groundwater basin is not succeeding in its sustainability, will it impact on neighboring groundwater basins? If we’re being a bit profligate and our neighbors are suffering, what happens? “When you say the Department has to step in, we don’t really have teeth to command compliance,” said Commissioner UNKNOWN. Chair Armando Quintero notes that if the State Water Resources Control Board had to step in, they basically would just stop pumping, not try to find other projects or actions. Commissioner del Bosque asks for a definition of undesirable result #2, a reduction in storage. “It’s the chronic decline of groundwater storage,” said Mr. Springhorn. “It’s very closely aligned with declining groundwater levels, so it’s groundwater storage is what that one is really centered on. So as the water levels decline, you also lose storage of the groundwater in the aquifer. “So it’s compaction you’re really talking about?” asked Commissioner Del Bosque. “Is that establishing some sort of a threshold in storage, like you want to have x amount of quantity in storage … ?” asked Commissioner Del Bosque. Access the agenda and webcast for this meeting of the California Water Commission by clicking here. 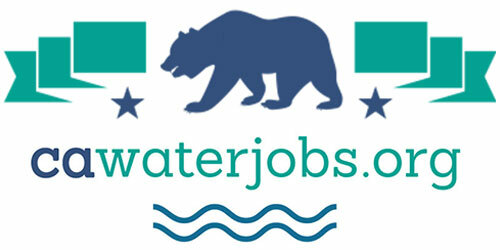 Visit DWR’s Groundwater Management Program online by clicking here.